The NYT's and Boston Globe's "Path to Equality"
Due in large measure to Occupy Wall Street, the wrongness and magnitude of extreme economic inequality is finally a non-ignorable issue, so much so that the establishment media feels it must deal with it in order to maintain some modicum of credibility in the eyes of the public. No longer is economic inequality the taboo subject it once was in papers like the New York Times and the Boston Globe. Knowing that the public is aware of the problem and wants it solved, the ruling elite's loyal pundits are writing about how to solve it, or at least how to make it appear that the ruling class is trying to solve it. Just today both the Boston Globe (here) and the NYT (here) ran opinion articles about the problem of economic inequality. The Globe's Lawrence Harmon, in his "Steps toward equality: Income disparity has long haunted Boston. Can Marty Walsh [the new mayor-elect] help?," offers suggestions for making incomes more equal. These suggestions are almost laughably ineffective ones, as we shall see. In contrast, the NYT article, to be discussed after the Globe's, is a brilliant illustration of how to defend inequality with a disingenuous application of what is, or comes very close to being, the entirely worthy principle: "From each according to ability, to each according to need." Let's start with the Boston Globe. First, Harmon advises the mayor-elect to engage in "A little finger-wagging" to Boston's poor people to make them "improve their routines," meaning to "place strict limits on their children's television time" and buy fewer lottery tickets and "control their weight by avoiding junk food." No, Harmon was not engaging in satire. Marie Antoinette famously (and perhaps apocryphally) suggested "Let them eat cake" when informed the poor did not have bread; Harmon--with genuine or feigned (who knows?) obtuseness--is merely unselfconsciously following her example. "High-quality education is and will remain the greatest equalizer. Had Menino [the outgoing mayor] managed to lengthen the school day significantly 20 years ago — and to have schools guided by top-notch principals with the power to pick their teachers — Boston would be much further along the road to income equality today. It would be a great shame if Walsh makes only similarly incremental educational progress. And God forbid if recalcitrant teachers’ union officials jerk him backwards." "Removing the barriers that effectively exclude non-union construction workers — many minorities among them — and encouraging open-shop contractors to bid on city-owned construction projects would be a swift way to address income inequality in Boston." One has to hand it to Harmon: he's got gall! In the name of taking "steps toward equality" he suggests finger-wagging; cracking down on teachers' unions so that the ruling class can over-ride teachers who object to making schools be the way Bill Gates--who champions equality all the way to the bank--wants them to be; and hiring non-union construction workers (instead of challenging possible discriminatory practices of some unions) so that Big Business can continue to pay low wages. 1. Many of the poorest people in Israel are the cause of their own poverty (the "poor by choice"), and wouln't be poor if they made better decisions about how to live, and this is why the better off have no obligation to share their wealth with such people. 2. There are two main categories of the "poor by choice": Orthodox Jewish families that have far more children than other Israelis and in which the husband only studies the Torah and the wife works to support the family; and Muslim Arab families that also have very many children and in which the wife stays home while the husband goes off to work. 3. "There is some good news. As a direct consequence of government policies, the employment rate among traditionally unemployed populations is rising fast. On the other hand, precisely because of this trend, the percentage of poor families with two breadwinners is also going up (it was 5 percent in the last report). Low-skilled workers are finally joining the work force, but naturally they can only get low-paying jobs and can’t earn enough to make ends meet and rise above the poverty line. Of course, this sends a potentially devastating message to those who are still unemployed that going to work isn’t worthwhile." "The state should be telling its citizens: We don’t much care if the poor-by-choice get even poorer and get even less from the state. We don’t much care about poverty rates that take everybody into account without much consideration of personal and communal decisions and their consequences. But we will ensure that those willing to work and pay their dues are properly assisted, and the government will make sure that they are the only ones to be raised above poverty level on the government’s dime." In writing, "we will ensure that those willing to work and pay their dues are properly assisted, and the government will make sure that they are the only ones to be raised above poverty level on the government’s dime" Rosner invokes (at least to a large degree) the spirit of "From each according to ability, to each according to need," which implies that if somebody does not contribute according to ability then they do not receive according to need. The problem with Rosner's "compassionate cruelty" is not, as many liberals would no doubt say, that it is cruel. I happen to agree with Rosner (and the "From each according..." principle) that people who do not contribute reasonably to society according to ability do not have any right to receive from it according to need. Thus working people do not have an obligation to support non-working aristocrats who believe that economically useful work is beneath them. If working people want to provide free-loaders with this or that, fine; nothing says they can't do so. But they are not morally obliged to do so, any more than peasants and serfs under feudalism were morally obliged to feed their aristocratic masters. 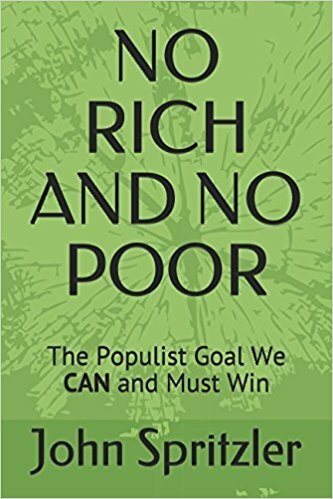 If Rosner had genuinely wanted to tackle the problem of economic inequality, he would have included discussion of how to solve the above two crucial causes of it. But he didn't. This would have required him to identify capitalism as the main problem. Nor would his opinion have been carried by the NYT if he had, I suspect. Instead, Rosner tries to deflect attention away from the real problem by focusing on the fact that some people choose to live their life in a manner that other people might consider to be "not contributing reasonably according to ability." But even in making this distracting point, Rosner is disengenuous. Here's why. Who's to say what constitutes "contributing reasonably according to ability"? Who's to say that studying the Torah is not "contributing reasonably" or that working outside the home as little as possible in order to spend the most time possible at home raising one's children is not "contributing reasonably"? Obviously the people choosing to live their lives this way think they are contributing reasonably. There is a genuinely democratic way of deciding what is and what is not a reasonable contribution according to ability, and it is spelled out briefly in "Thinking about Revolution" and in more detail in "What Replaces the 'Free Market' in a Sharing Economy?" The method involves making social decisions by egalitarians in local assemblies using voluntary federation. This is entirely different from the way social decisions are made today in Israel and virtually every other nation, in which a central government makes laws that everybody is commanded to obey. It is not out of the question that a genuine democracy would accept Torah study or some amount of it at least as a reasonable contribution entitling one to receive "according to need." It is even more likely a genuine democracy would consider full time at-home parenting by a mother or a father (not both) as a reasonable contribution. Instead of entertaining such possibilities, however, Rosner hoped to persuade his readers that many (most?) of the poor in Israel deserve their poverty. * Rosner also mentions that many of the poorest Israelis are not really as poor as they seem because "Haredis [orthodox Jews] and Arabs are disproportionately represented in the underground economy (namely, by evading taxes)."